Aminuet is a collective space and contains fansites and fanlistings from subjects I like. I'm Kibumie and this lovely site has been online since winter of 2009. The site was born on December of 2009 to host fanlistings and then morphed into what you see now. The name A - Minuet is found from my first Suzuki book at the glossary page. (It was an ini-mini-miny-moh moment.) As of 2016, I have decided to downtime and archive Aminuet. My interests and priorities in life have changed, and I want to spend the hours of my days with the number one thing I love to do. Since Aminuet was a fun chapter in my life, I still want to see it online. This domain will stay online for as long as Winnie the Pooh exists! I'm still around and lurking with my beloved friends. Hi! 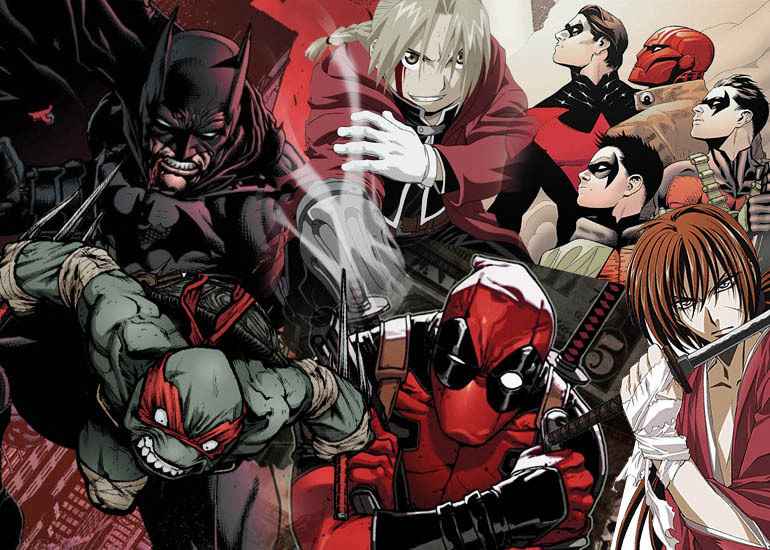 I'm Kibumie online, and here's an image chart displaying my all time favourite characters and fandoms~ ♥ They are a delight to me since childhood, and I've carried to love them as of today :: Batman, Raphael, Edward Elric, Deadpool, Robins, and Kenshin. As you can tell above, I'm more of a comic person. I watched Batman the animated series, and BatKeaton movies, and TMNT cartoon as a kid. And then I was introduced to anime when I was in grade school. The first anime that I like was Rurouni Kenshin. In 2011, I got into comics with Batman and Deadpool as the main titles I follow. And then my interest has gradually moved. Other titles I read are Superman, Spiderman, TMNT, and Justice League. (I don't have a lot of other titles that I read because there's too many!!!) I like to watch movies with friends/family, and rarely marathon tv shows. I started web designing with a blogger account in 2008. I draw everyday and I have my own comic called Alzyon. I also play the violin sometimes. ♥ If you want to chat with me: you can find me at discord via amassment or at my new twitter. If you have any inquiries regarding the site, please contact me here.